Horse racing is in my blood. My grandfather, the late J.P. Ryan was a trainer and so horses were a large part of the family's life until his death in the mid 60s. The seed was planted well enough so that the extended family continue to attend race days for the purposes of family entertainment and gambling. Most of my racing attendance has been at the Hawke's Bay Race Club in Hastings. It's not a fancy horse racing venue though the surrounds of the Havelock Hills and wider vista down the Heretaunga Plain make it a perfect spot to watch the horses come pounding in down the home straight. Indeed, the sound of the hooves hit the turf as they near the winning posts is perhaps one of the most awesome sounds you'll hear. Late for the races one day, Dad did a phone bet for us kids on Master Blaster, chosen specifically because of its name. As we headed to the track we listened to the race on the car radio. I don't recall where he was in the race at the time but he fell over a hurdle and broke his leg. Us kids felt pretty bad about that though not as bad as the vet who had to put Master Blaster down - he actually managed to shoot himself in the hand before the lame animal was finally spared. Before the recession tanked everything, there used to a race called the Kelt Capital. It was a Group 1 race, meaning it was a prime race and had prime horses - to win it was to mean you had a fine horse on your hands. I remember the popular Horlicks won it in dead heat which was kind of exciting back in the day. Arguably NZ's finest race horse, Sunline was a modern day champion that NZ fell in love with. She won just about everything she raced in - including famously two Cox Plates. And she wouldn't just win, she would win by miles - at the turn or top of the straight her jockey, Greg Childs, would let her go and she'd just leave the other runners in her dust - it wasn't until her later years as she aged when younger horses like Northerly could catch her. Despite her winning 32 out of 48 races, I think I lost more money on her than I won! Everyboy has their favourite horse and my brother David's was Bonecrusher. While Simon liked dinosaurs and I liked snakes, David liked Bonecrusher like JFK liked blondes. 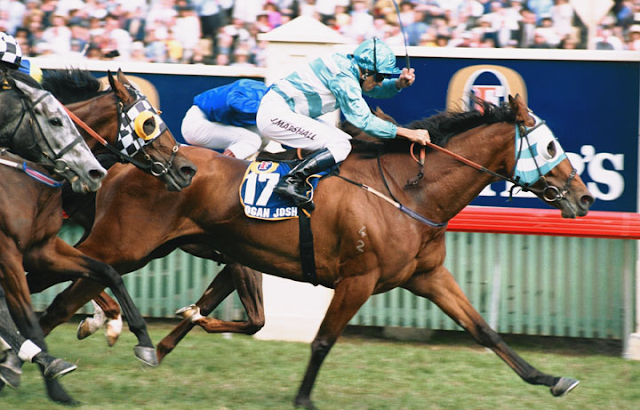 I'd never heard of Rogan Josh until he won the Melbourne Cup - it seemed a bloody odd name for a horse and it was my who informed me that rogan josh was actually an 'aromatic lamb dish hailing from Kashmir'. Mum. And she then made it for the next evening's meal and I've been ordering it to eat ever since! I think this is my personal favourite - Empire Rose was another Melbourne Cup winner and I think the reason why I loved her as a kid was she was sooooo big. I remember the Cup race vividly enough to recall that Natski got second - it's not very often you can remember who got second so it must have been a good race eh? Apparently as the two went past the post, while Empire Rose's nose was ahead, her rump was behind Natski's - which just goes to show how big she was!